Hamburg - Although TSG 1899 Hoffenheim could only manage a 1-1 draw against Hamburger SV on Matchday 8, French striker once again proved his worth to the Kraichgauer cause with the opening goal at the Imtech Arena. The 26-year-old has now scored three times in six appearances so far this term and is convinced the erratic displays that defined the Sinsheim-based club's campaign in 2013/14 are a thing of the past. Anthony Modeste: I'm not. You can't be happy after a game like that. I'm happy to have scored so early, but I might have had a second. In the second half I had to go off with an ankle injury. We didn't play our best against HSV, but at least we came away with a point. bundesliga.com: Is a draw the right result? 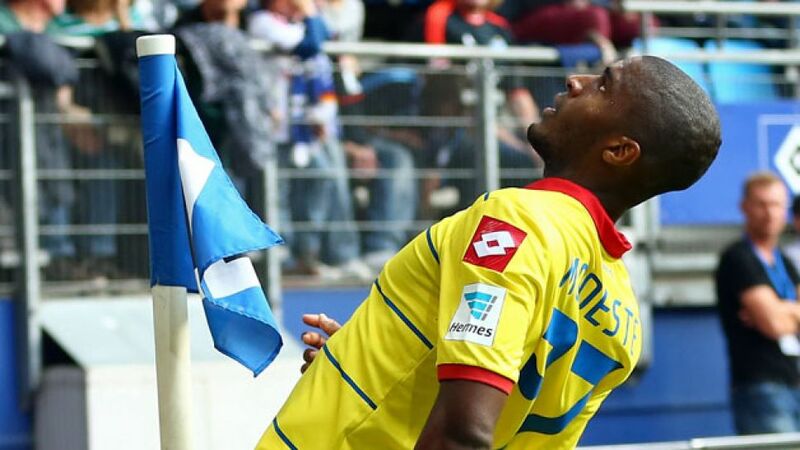 Modeste: I'm in two minds. On the one hand, the game was there for us to win, but on the other, HSV didn't deserve to lose. So a 1-1 draw is probably a fair result for all concerned. bundesliga.com: Hoffenheim are now joint-third in the table. How do you explain this success? Modeste: It's great. Compared to last season we've come on leaps and bounds. We're so much stronger defensively and concede fewer goals, but we've lost a bit of our wild attacking side as a result. As a striker, I obviously prefer the attacking business to the defending, but everything's great as it is. bundesliga.com: How much would you say the upward trend is down to Oliver Baumann, who made some great saves to secure a point against Hamburg? Modeste: Hoffenheim signed a quality goalkeeper in Oliver Baumann. Nothing against Koen Casteels, who's unfortunately injured at the moment, but we've been conceding fewer goals, and that speaks volumes for Oliver, who continues to impress by the game. bundesliga.com: Including last season, the draw also means Hoffenheim have now set a new club record of nine consecutive matches unbeaten. Does that make you proud? Modeste: For starters, that's just a snapshot of how things are at the moment. We all know it's only where we are at the end of the season that counts. The fact we haven't lost is great for our confidence. It makes us strong. Modeste: Every summer there's speculation about my future because I've already played for a number of clubs. The truth is, I contemplated moving on, but I like it at Hoffenheim and feel happy here - and you can see that on the pitch. bundesliga.com: Will we see that against Paderborn as well? Modeste: We'll have to see. First things first, we have to analyse the Hamburg game, recover and then focus all our attentions on the next game. We're in a good place right now. As long as we can play our game, I think we'll have a good chance of picking up the win. bundesliga.com: What now are Hoffenheim's aims for the season? Modeste: Nothing's changed: we're only thinking on a game-by-game basis and wanting to gradually improve. Obviously it'll be nice if we're able to finish higher than last season.